Our cake recipe this month is very unusual as it rare that a cake has a cup of vegetable oil in the recipe. 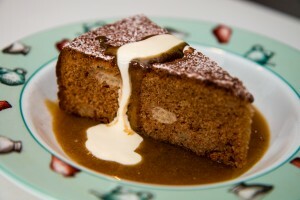 Fantastic with the hot butterscotch sauce as well as good quality ice-cream and cream. Best eaten on day of baking and will keep for 3-4 days in an air tight container. Enjoy!